MUSD Bond Committee received the endorsement of Senator Pro Tem Kevin de Leon, the highest ranking Senator in California. 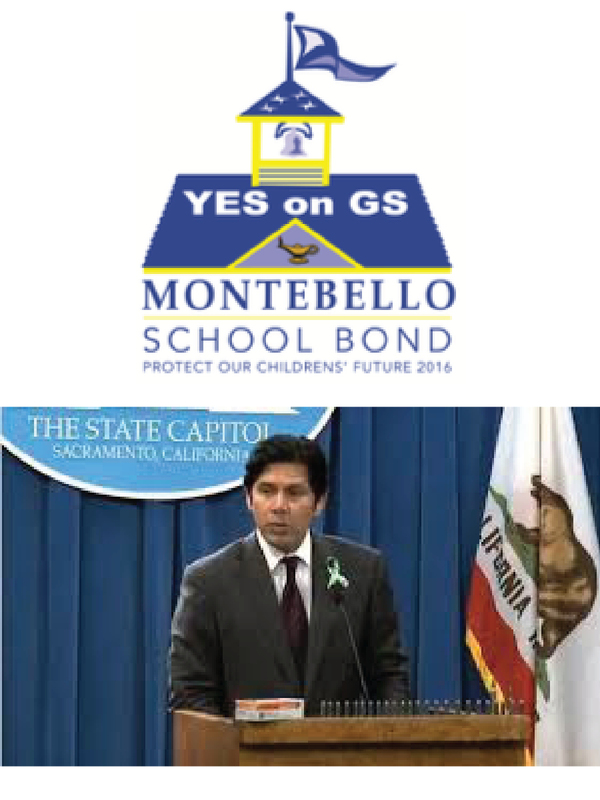 (MONTEBELLO, CA) Today, Montebello Unified School District Bond Committee received the endorsement of Senator Pro Tem Kevin de Leon, the highest ranking Senator in California. “The passing of Measure GS will bring millions of dollars to Montebello classrooms and provide the local community with new jobs,” said Senate Pro Tem Kevin de Leon. Montebello Education leaders will be asking voters to support a new School Bond that will improve classroom technology, upgrades to computer and science labs, libraries, career and vocational education programs, leaky roofs, bathrooms, drinking fountains, and plumbing. In addition, the bond would also improve earthquake safety standards, fire safety, school security, and repairing facilities and school equipment. Upon passage of Measure GS, independent performance and financial audits will be performed annually to ensure that bond proceeds are spent only on District projects, with no money used for administrators’ salaries or pensions. There is no information on the bond other than being $300 million.